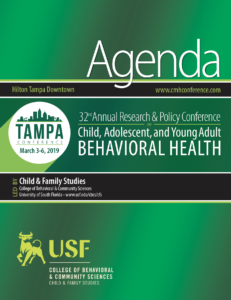 We have updated the agenda for the 32nd Annual Research and Policy Conference on Child, Adolescent, and Young Adult Behavioral Health (The Tampa Conference) to include hyperlinked files from presentation slide decks that we have permission to post. Hyperlinked files are highlighted in blue. Click on the image below to download the updated agenda with hyperlinks.